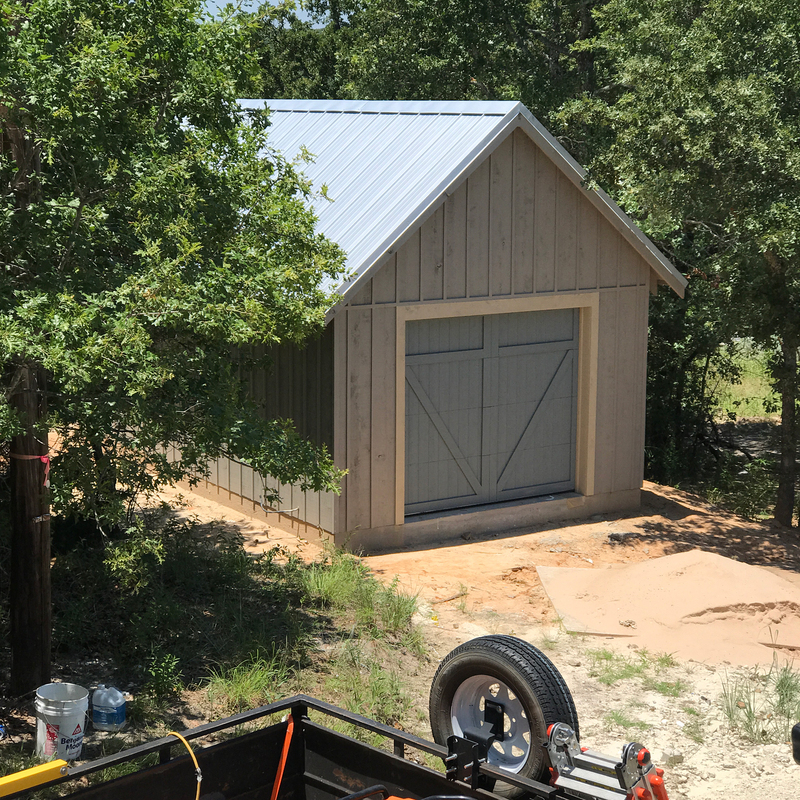 Because the sunlight was so harsh, the garage was the best structure to showcase our chosen paint colors in a photograph. Here’s the progress as of Thursday, June 29. 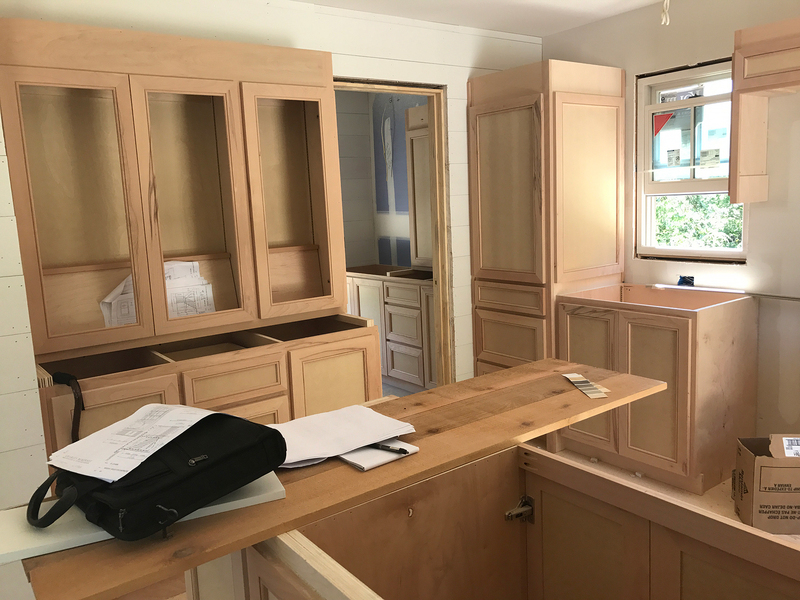 All the cabinetry had been installed, and the carpenter was informed on how to proceed with the trim work. The painter applied floor stain samples and interior paint colors for our approval. 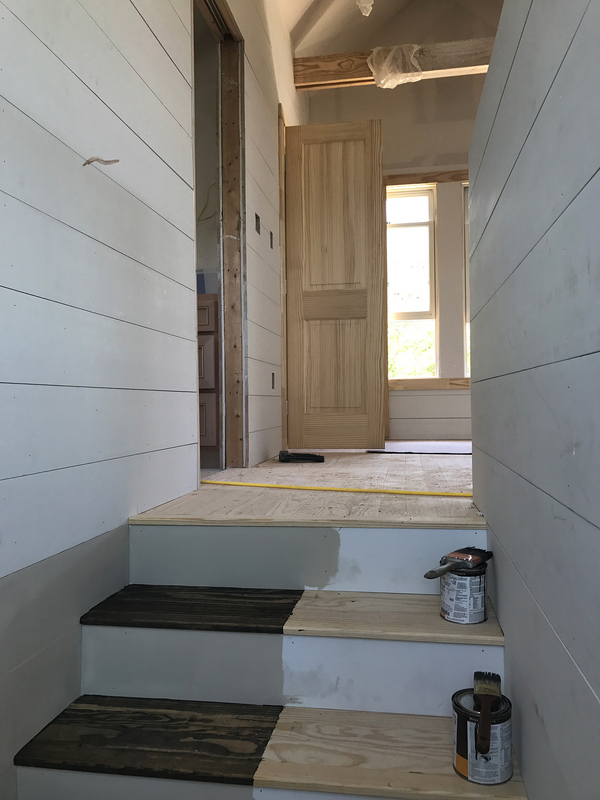 Unfortunately the floor stain was not at all what it was suppose to be, but the selected interior wall, ceiling, and window/door trim colors were perfect. 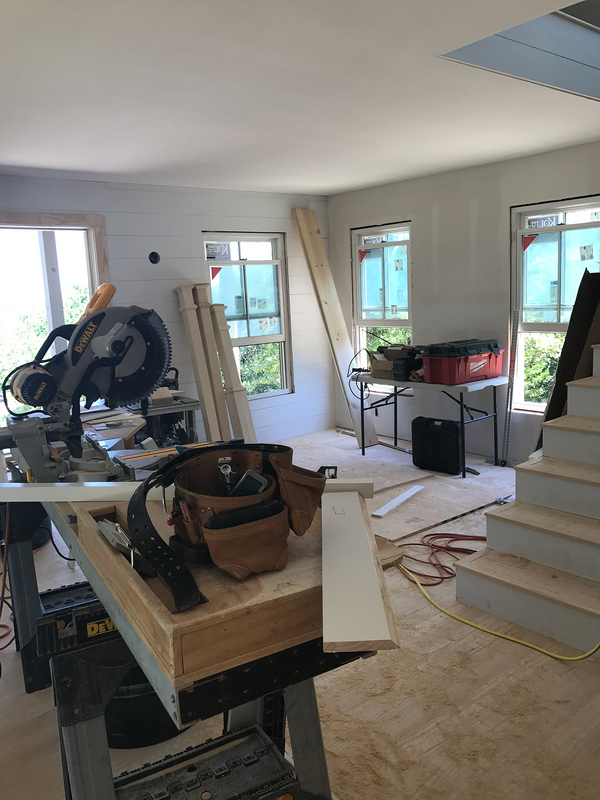 The design and materials for the front steps and the descent down to the driveway were finalized, and one final site survey was done. I know I’m forgetting several somethings, but the following photographs should illustrate how far things have progressed. 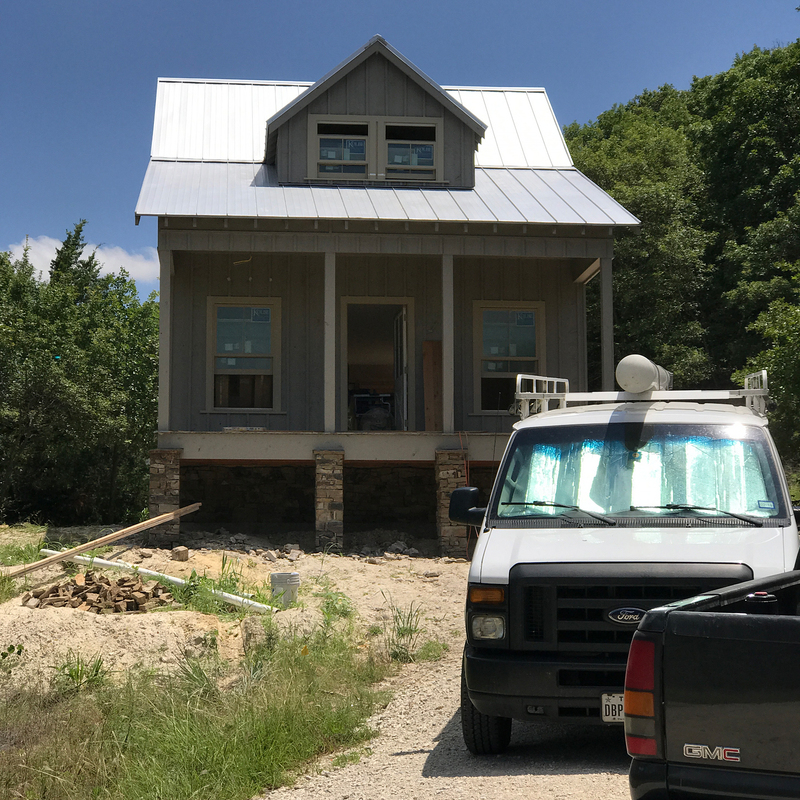 (above) The entire house’s body is a warm gray, including the porch columns, but because the light difference, the porch columns appear lighter. 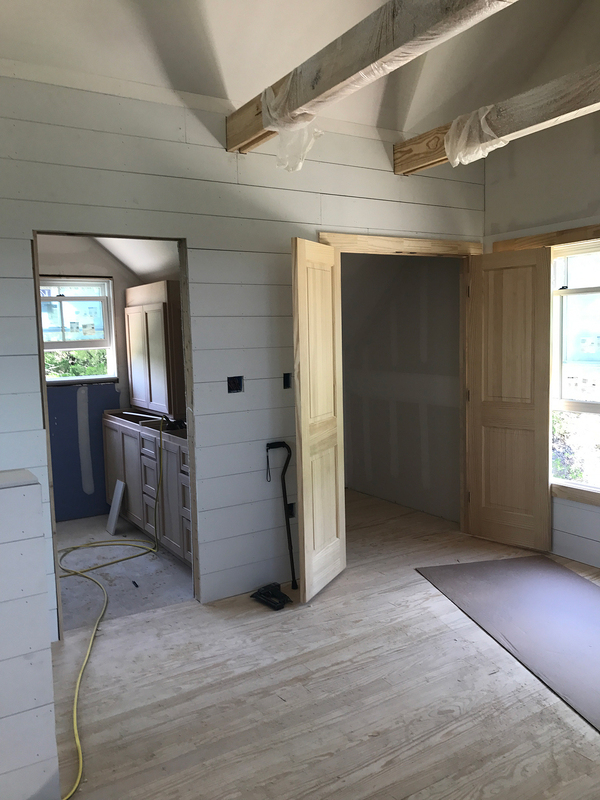 All window and door trim is the sandy color, and the doors and yet-to-be-made window shutters will be a blue-gray. 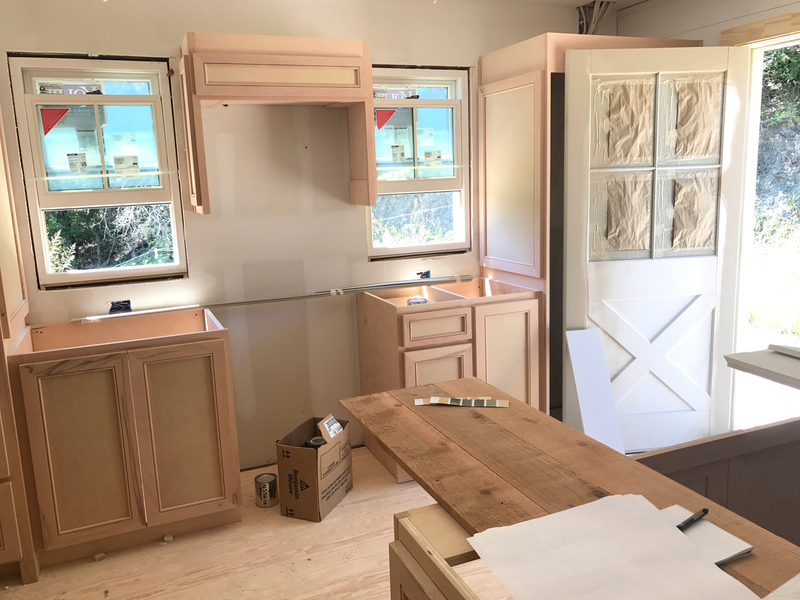 (above) The back door takes us into the kitchen area where the cabinetry has been installed. The wood board walls and pine flooring are now in place. (above) A view from the kitchen to the front of the house. (above) Looking into the kitchen and back wall where the range will go. The refrigerator will be installed behind the back door. (above) Another view of the kitchen area, and beyond you can see the downstairs bathroom with its cabinetry. 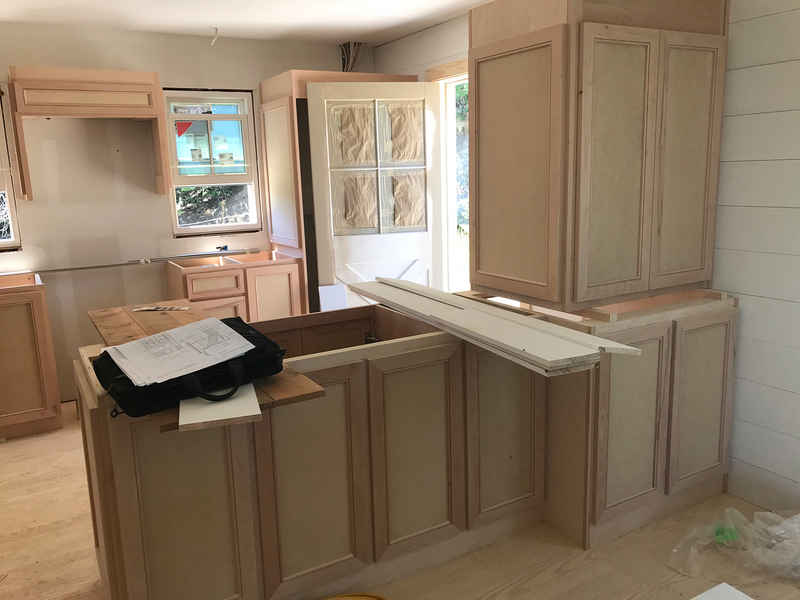 (above) This side of the cabinetry delineates the dining area. (above) Looking towards the front of the house. 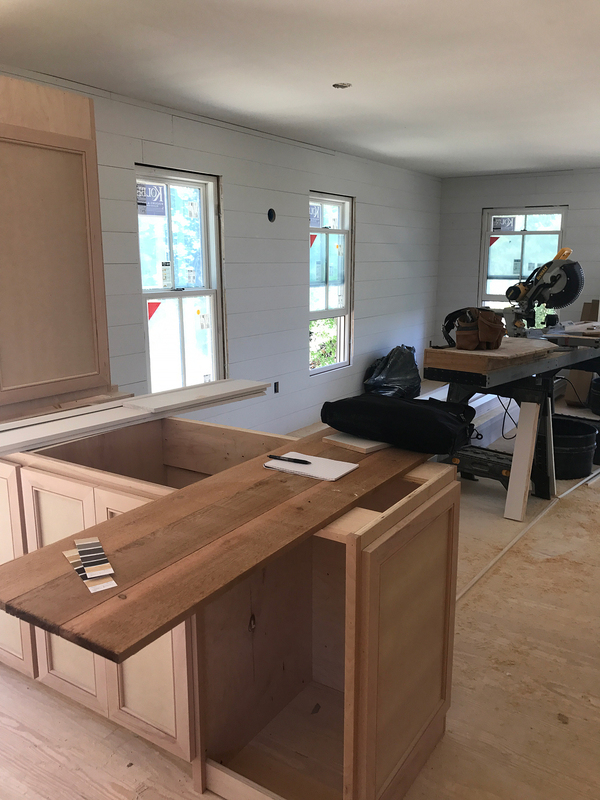 The wood burning stove will be placed between the two windows where the construction table is now, and the entire wall will be clad in a stone veneer. The newel posts you see leaning on the front wall are not what was specified and have been banned from the construction site. (above) Up the staircase we go. 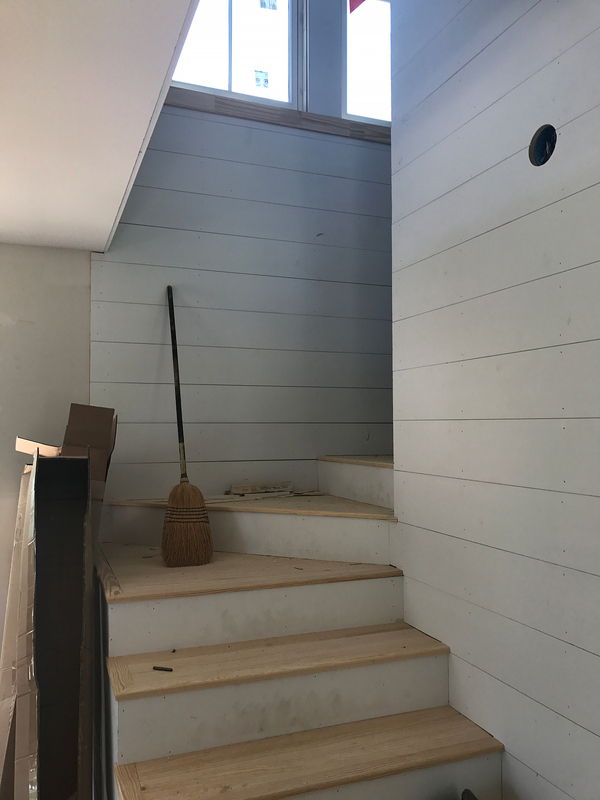 (above) Halfway up the stairs is the closet that will contain the stacking washer/dryer and the tankless water heater. There’s a pocket door that will close this up. (above) The stain that we selected was way too black and wasn’t even close to matching the swatch. We will have to start over and create our own blend. The wall paint color is final. It looks darker than it really is because it’s in the shadow. (above) In the master bedroom looking towards the bed alcove on the left. In case you’re wondering about the dangerous staircase opening, there will be a banister around it. (above) In the master bedroom looking towards the master bath and closet. 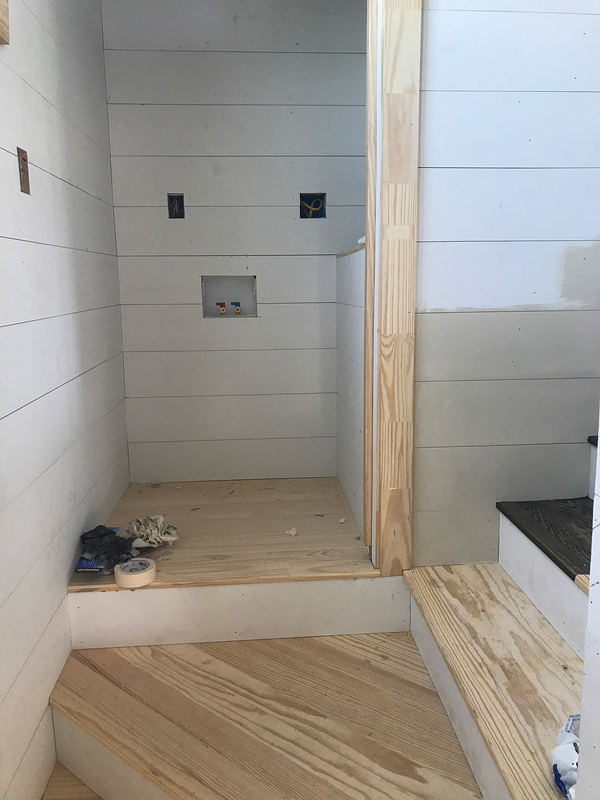 (above) Looking into the master bath, you can see the future shower in the foreground. 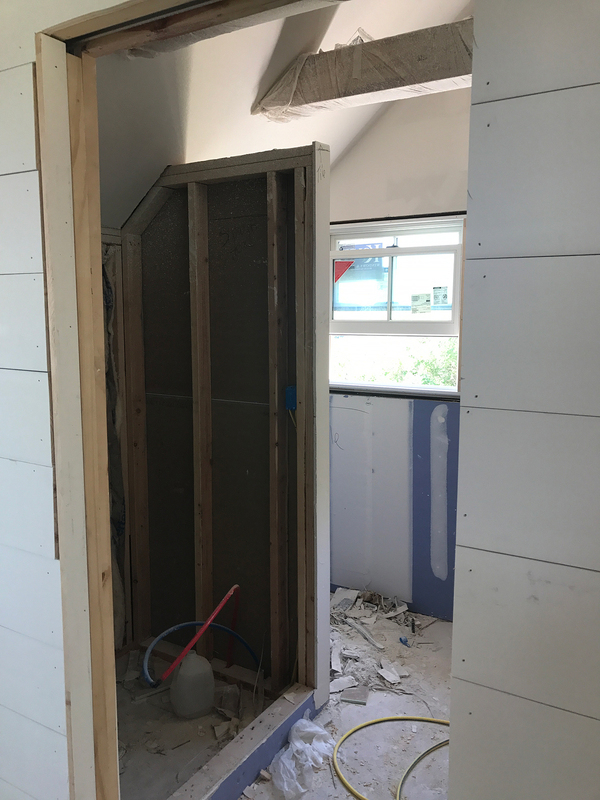 The bathroom will also have a pocket door. (above) Here are the selected interior paint colors. 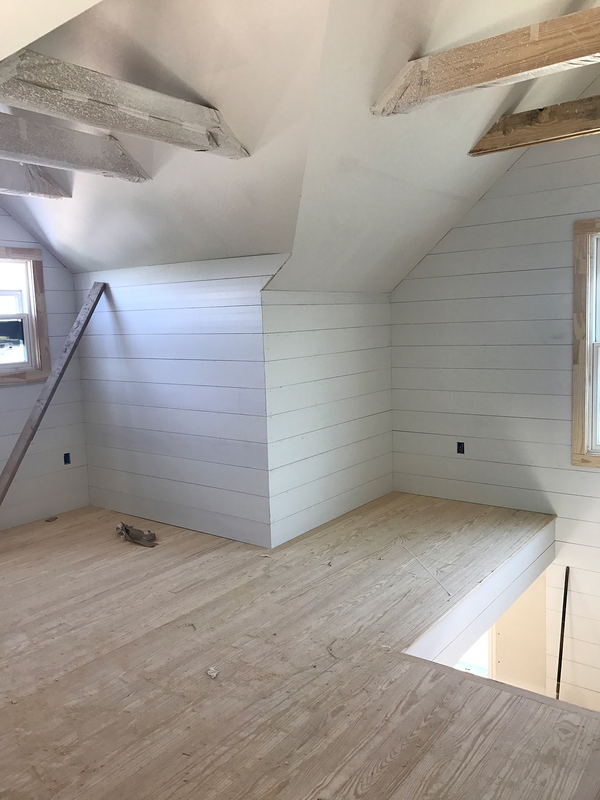 The walls will be the sandy color (not the same as exterior sandy color), and all the window and door trim will be the warm gray. 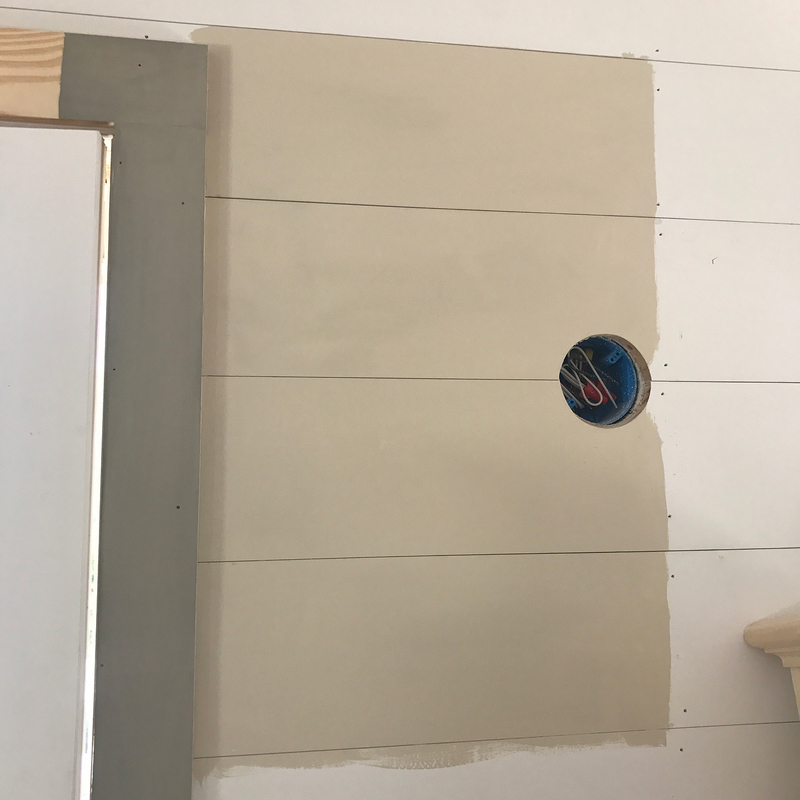 The wall color appears different in areas of the house because of the light change. 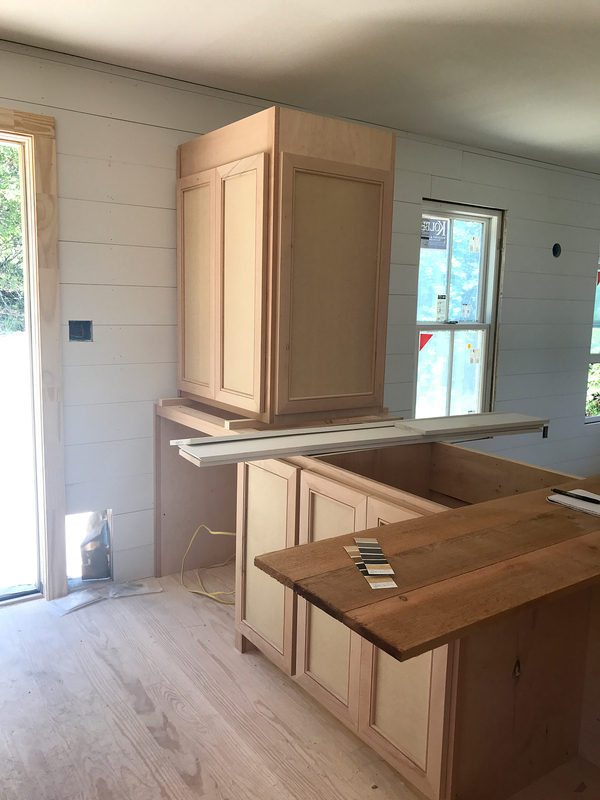 And I almost forgot… The cabinets will be the same warm gray as the window and door trim. It’s coming along beautifully! You must be delighted. I can’t wait to see the final interior. The angles and light are fascinating. Very nice little retreat. I enjoy the updates. Thanks for the update! It’s so fun to watch the progress. I am loving the bed alcove. Again, I have to mention how much I like those beams!